We’ve gotten many requests for more details about the game's music, so in this update we'll discuss our current plans for that. There's also a surprise buried deep within the update for all you music lovers out there, so read on to find out what it is! Souls, the supernatural, a fantasy setting, mature themes... These are just a few of the big ideas behind Project Eternity's story and world. As with any great CRPG story, music plays an important role in communicating those ideas. This was true for the Infinity Engine games as well. Looking back they all had one thing in common with regards to music: all are known for having strong and memorable soundtracks that drew you in as a listener and set fire to your imagination. That's exactly what we're aiming for with the music for Project Eternity. Now you might be wondering, out of all the possible descriptive words, why these three? The answer to that goes right back to those big ideas mentioned above. 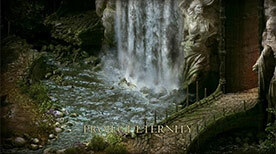 We chose mystical because of the importance of souls and the supernatural in Project Eternity's world. Ancient because we want the music to be grounded and appropriate to the setting.Emotive because the role of music in any game is first and foremost to provide dramatic and emotional context for the player. At the end of the day, that's what we want out of Project Eternity's score. We want you to be swept away by the music and the imagery it evokes. By keeping these three descriptive pillars in mind while developing the score, we’ll be able to support and enhance the narrative goals of our game. Of course these three words are not all the music will ultimately be. It'll also be adventurous, ethereal, and wondrous when appropriate. Ominous, dark, and mysterious when called for. Scary and horrifying at just the right moments. And yes, driving, bold, and colossal when absolutely necessary. Along with defining what we do want the score to sound like, there are also some things we know we don't want it to sound like. It won't be overly heavy or oppressive, nor will it be bombastic and grandiose from beginning to end. We want the score to be as dynamic and nuanced as the story it serves, and the last thing we want to do is weigh that story down with leaden music. As you can see Project Eternity's music will be many things when all is said and done. But perhaps most importantly, its music will have a unique and original voice that we hope will leave a lasting impression, the same way the music of those awesome Infinity Engine games did in the past. Making the Project Eternity campaign video was the result of an inspiring collaborative effort here at Obsidian. Adam Brennecke, Dimitri Berman, and I worked on it day and night for nearly a month; doing what we could to make the strongest first impression possible. To help accomplish that, I knew I wanted the music to make a powerful statement right out of the gate. I wanted it to grab your attention and keep you mesmerized until the final seconds of the video. Suffice it to say that when I wrote this music, I never could have imagined the overwhelmingly positive reception it has since received. The support you all have shown Project Eternity and Obsidian has been a stunning, and deeply humbling experience. Look for an update about class design from Josh Sawyer tomorrow, and we are about 1,800 backers away from adding another level to The Endless Paths dungeon!